Explanation: Is that a black hole? Quite possibly. The Cygnus X-1 binary star system contains one of the best candidates for a black hole. The system was discovered because it is one of the brightest X-ray sources on the sky, shining so bright it was detected by the earliest rockets carrying cameras capable of seeing the previously unknown X-ray sky. The star's very name indicates that it is the single brightest X-ray source in the constellation of the Swan Cygnus. Data indicate that a compact object there contains about nine times the mass of the Sun and changes its brightness continually on several time scales, at least down to milliseconds. Such behavior is expected for a black hole, and difficult to explain with other models. Pictured above is an artistic impression of the Cygnus X-1 system. On the left is the bright blue supergiant star designated HDE 226868, which is estimated as having about 30 times the mass of our Sun. 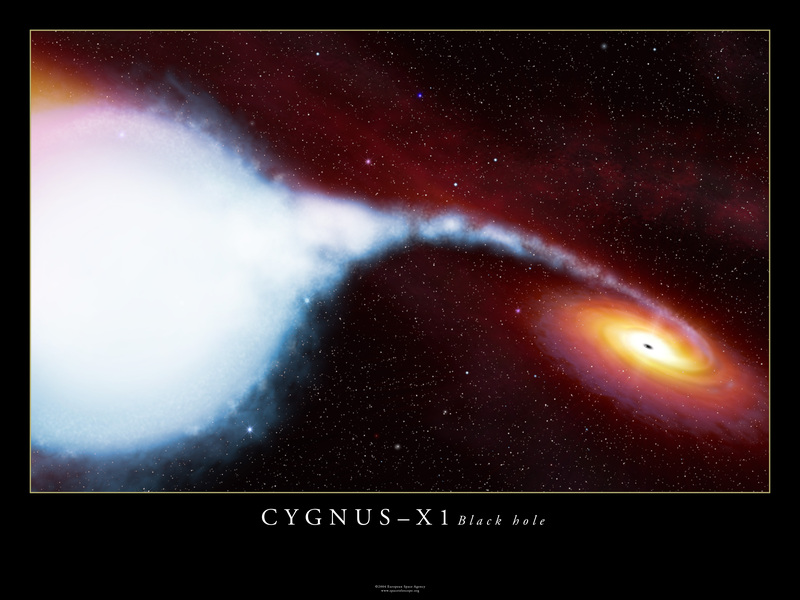 Cygnus X-1 is depicted on the right, connected to its supergiant companion by a stream of gas, and surrounded by an impressive accretion disk. The bright star in the Cygnus X-1 system is visible with a small telescope. Strangely, the Cygnus X-1 black hole candidate appears to have formed without a bright supernova explosion. Strangely, the Cygnus X-1 black hole candidate appears to have formed without a bright supernova explosion.